Art Deco district. Landmark lifeguard stands. Lively atmosphere. Affectionately known as SoBe, South Beach was the first section of Miami to be developed as far back as the 1910s. A thriving center for beautiful beaches, nightlife, shopping, and dining, South Beach’s real estate runs north from 5th street to 22nd street. 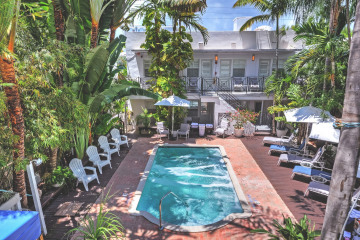 A major destination for tourists from all across the globe, South Beach is packed with condos and historic Art Deco hotels like the Colony and the Beacon. Its brightly painted lifeguard stands line the beautiful beaches at every block. A fast-growing mode of transportation in South Beach is the bicycle. New programs like the “Deco Bikes” allow residents and visitors alike to rent designated bicycles from strategically placed stands throughout the area. Enjoy the sunshine at Lincoln Road, an outdoor mall lined with boutique shops, bars, restaurants, and theaters. Real estate options in South Beach consist primarily of condos, ranging from luxury oceanfront buildings such as 1500 Ocean and Capri South Beach to smaller, more budget-friendly buildings located just a few blocks of the beach.